This camp provides an excellent educational experience for your kids over spring break. Each day, we will cover a different environmental topic. Kids will participate in arts and crafts, field trips, recreational time, and other activities! Early drop off (7:30am-8:45am) and late pick up (3:15pm-5:30pm) times are available for an additional $10/day/child. Registration for Nuts About Nature Spring Break Camp opens February 11 at 9:00am. With a different topic each week from Reptiles Week to Conservation Week, this camp provides an educational experience for your kids with crafts, field trips, recreational time, and other activities. Early drop-off (7:30am-8:45am) and late pick-up (3:15pm-5:30pm) times are available for $10/day/child. Even the little ones can learn about animals, habitats, and the environment as a whole. 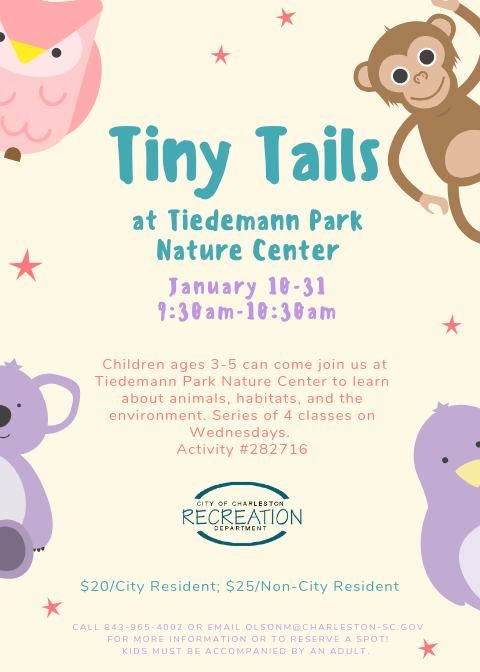 Each class will include a story and snack at Tiedemann Park. Series of 4 classes. 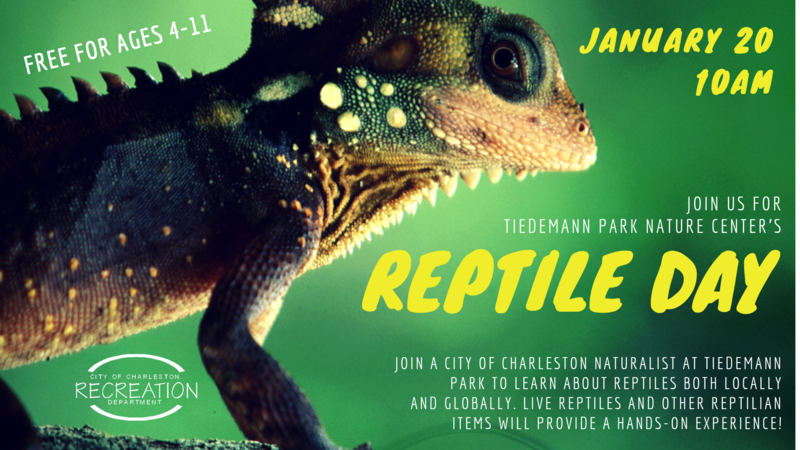 Join a City of Charleston naturalist at Tiedemann Park to learn more about various reptiles found both locally and globally. Live animals and other reptilian items will provide a unique hands-on experience! Buzzzz into Tiedemann Park for a morning of Insect Investigation! Participants will get a chance to be a part of a Human Insect Building Activity and possibly hold a HISSER (Madagascar Hissing Cockroach). Get ready for St. Patrick's Day with us at Tiedemann Park! All participants will have the opportunity to make clover potter and discuss the myth on how St. Patrick chased snakes from Ireland. Some of our live snakes will also make a showing! Join us at Tiedemann Park to learn about the sport of archery and take shots at a target! Check out our School Programs Flyer here! Call Matt Olson to schedule or for more information.